There has been much excitement in the Grady family in the last couple of weeks, as we welcomed no less than FOUR new arrivals to the clan. Yes, four little bundles of loveliness hopped their way into our lives and, in the process, into my dad's garden pond. I'm talking about frogs, people. FROGS. This is by way of being a momentous event. The pond was created some years ago, and has been the scene of many a small drama: the disappearing fish which, it transpired, were being eaten by a heron; the sudden and unexpected appearance of fish fry, six of which are growing into a new population to replace the heron victims; the fox barking an alarm when the lining sprang a leak; the Dread Winter of 2010 which was miraculously survived by quite a lot of the inhabitants... But to date, no frogs. Not one. And suddenly there they are, four of them! Maybe it's some kind of froggy bus service thing? They appear to be common frogs but to be fair I'm not that up on my herpetology so they could be any kind, really. So. 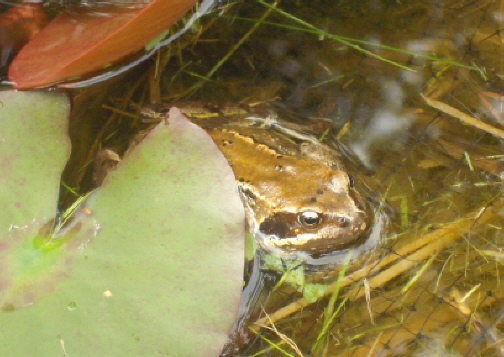 Some days later, Mum decided to have a wee peek at Mr Frog, to see how he was getting on with his fishy neighbours. A leap, a splash, a flurry of comedy legs, and a second frog hopped into view. Quite what the two of them were up to before Mum appeared I don't care to speculate, but oh, the excitement. It was like something from a David Attenborough programme. Except not in glorious HD slow motion. Somebody call the BBC! Here is the second visitor, captured on camera just before a dive into the pond. A chubby little chappie (or possibly chappess) and clearly a bold adventurer, as he was out and about, checking out the neighbourhood, in general defiance of any cats, herons, seagulls or lawnmowers that happened to be lurking in wait. By this stage I was, needless to say, beside myself. I could barely wait to get up there and see the little critters. 'Wow', I thought. 'He's the best yet.' 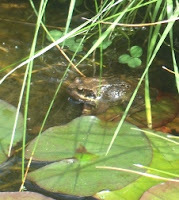 Delightedly, I sent the photos to Froglife, hoping they would be able to identify the type. Imagine my total over-reaction when they responded, saying: 'We don't think that's a UK frog...' Oh. My. God. It's a new species, previously unknown to science and discovered, albeit accidentally, by My Dad. It shall be named after him, Froggius Daddus, and stand as an eternal monument to the excellence of his pond. Or not. 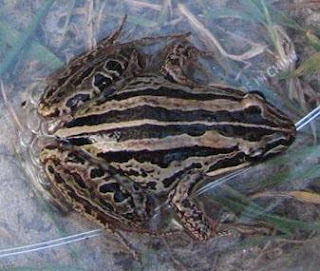 Further internet searching suggested this was in fact a Striped Marsh Frog, native to Australia. What the...?? How in the wide, wide world did it get here? Alert the media! Scramble the Frog Squad! Send in the boffins! And, once again, call the BBC! And then came the phone call. Mum was ringing to inform me that this, in fact, is neither a species new to science nor Frog No. 4. It is, sadly, a photo Dad found on the web. He thought it looked like the little fella from his pond and in sharing it with his family almost sparked an International Incident among the world's herpetologists. Thankfully we discovered the error in time and were able to head off the Scientific Discovery Teams ready to congregate on Glasgow's South Side at that very moment. Phew. Today's news on the frog front is that Dad, for some reason best known only to himself, decided to spray the surface of the pond with the hose. This, apparently, seriously disgruntled the newly-settled froggy population, all of whom seem now to have disappeared. Silly Dad. I am hoping they are merely hopping mad (ahahahaha) and will return in due course. Please hope with me, because a world where no frogs live in my Dad's pond is, suddenly, a smaller and sadder place to be. 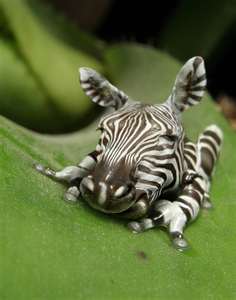 ***UPDATE*** There has been a sighting of the alleged 'zebra' frog! Ahahahaha. No, this is him really. Quite what natural history programmes Dad has been watching I don't know... But still! The frog has returned!! I am so disappointed that dad didn't actually find that frog in his pond. Dude. Are there any frogs at all? Is he just winding us up? First Foodie Pen Pal Package! Post the first - what am I doing here?